Two weeks into our passage from Nonsuch Bay, Antigua to the Azores, we had less than 300nm to Flores and about 400nm to the main harbour, Horta. We were relying on weatherfax for short-term forecasting and listening to Herb Hilgenberg, a Canadian weather expert who was routing some near-by boats via SW radio. 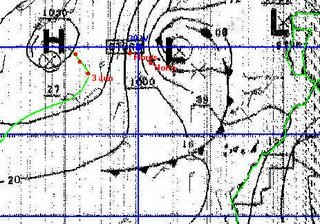 That evening (Sunday), Herb advised that a low pressure system was expected to form over the Azores by the middle of the week, bringing wind to 45 knots from the North West. A day earlier this had been forecast to bring wind in the 25kt range – quite an increase. 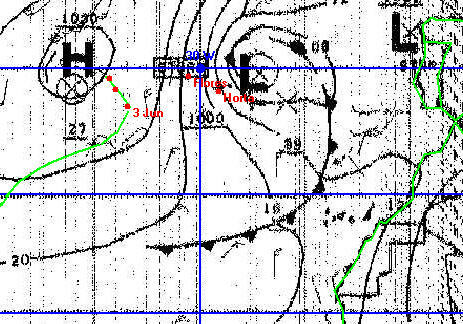 With strong winds forecast, we ruled out heading to Flores as the habour is small, and would be upwind in a near gale. The winds would also be gale force around the time we got to Horta. Not liking the changing forecast for a system due to form in only 2 days time, we reluctantly diverted to the NW, to wait for the low-pressure to form and then move east. Still wondering if we had done the right thing, we tuned in to Herb the following night (Monday). We were now at 38N 38W, and so well clear of the stong winds. Amazingly, the yacht closest to us that Herb was advising (which was slightly further from Horta than us), decided to keep pushing onwards to Horta, as a Wednesday morning arrival was planned. We waited 3 days for the system to form and begin to head east, before we resumed our course. We arrived in Flores 20 days after leaving Antigua.